She may have been preaching to the choir — most everyone who attends the American Heart Association's Go Red for Women Luncheon understands the benefits of eating well — but chefNikki Shaw knows that a friendly reminder never hurts. So the wife of Denver Nuggets head coach Brian Shaw took care to remind the 410 guests that it's just as easy to eat foods that are good for you as it is to grab a fat- and calorie-laden fast-food item to gobble on the go. Knowing that some mornings she'd be rushed to the point where she wouldn't even have time to cook a vegetable-filled omelet, Shaw said she would steam or grill an assortment of vegetables on, say, a Sunday evening and then grab a handful to eat in the car as she drove carpool or headed to an appearance. "Once I started eating veggies for breakfast, I noticed I had energy through the roof. They gave me mental clarity and the energy it takes to balance home, career and our kids' activities." Go Red for Women, chaired by HealthONE president/CEOSylvia Young and emceed by media personalities Christine Chang and Denise Plante, is sponsored by Macy's and presented by the American Heart Association as a way to emphasize that incorporating good heart health practices into daily life is easier than one might think. Shaw, a finalist on Season 3 of "The Next Food Network Star" and host of "Today's Flavor," a radio show streamed on 107.5 WBLS in New York, is also a featured chef for a number of entities, including the Los Angeles Lakers, Kaiser-Permanente, the American Diabetes Association and the American Heart Association. After lunch — a heart-healthy meal of chicken and veggies prepared by Ruben Garcia, chef at the Ritz-Carlton Denver — many of the guests remained for a cooking demonstration led byTanya Winfield, who had been a contestant on Season 15 of "The Biggest Loser," and to check out displays from a dozen or so companies that focus on healthy living. From left, Mauren Tarrant, Christine Benero and Gretchen Hammer. Kaiser-Permanente's Dr.Jandel Allen-Davis co-chaired the luncheon and presented the 2014 Impact Awards to a group that included the AHA's Teaching Gardens program, Great-West Financial, Irene Lofland, vice president and general auditor for DCP Midstream, and the family of the late Rekesha Harris. Harris, who had been a spokeswoman for the Go Red for Women program, died in January after being diagnosed with what was described as an extremely rare form of heart disease. Jennifer Alderfer, left, and Becky Adix. Trisha Hood, who has attended each of the 10 Go Red luncheons held in Denver, was there with her daughter, attorneyChelsey Russell, and a group of friends that included Louise Richardson, Cindi Burge and Gail Johnson. Others supporting the cause were Mile High United Way's chief executive, Christine Benero; former Heart Ball chairmenCharlie and Patti Nelson; Kim Bimestefer, regional president for Cigna; Diane and Tom O'Connor, chairs of the AHA's Cor Vitae philanthropic giving society; Kimberly Arnold, who heads the Circle of Red donor group; and Jennifer Evans of the Polsinelli law firm. The National Childhood Obesity Foundation®, Inc. (N.C.O.F.®) announced its plans to launch a national “health and nutrition awareness” campaign featuring Celebrity Chef Nikki Shaw. The N.C.O.F.® awareness program will focus on educating children and their caregivers on ways to prepare healthy and nutritious meals. We live in a consumer driven environment where words like “Sugar-Free”, “Sodium Free”, “Organic”, “No-GMO” and “Gluten-Free” just to mention a few creates considerable confusion when it comes to making proper nutritional choices for our children. N.C.O.F.®’s mission is to reduce or eliminate that nutritional choice confusion. That is why N.C.O.F.® is engaging Celebrity Chef Nikki Shaw and it’s advisory board members, educators and experts to provide a common sense roadmap to providing the best meals and food choices for children. 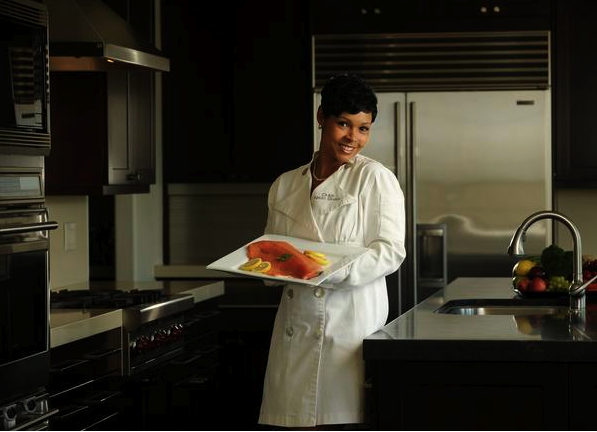 What many people don’t realize, Celebrity Chef Nikki Shaw is a working mom. She faces the daily challenge of feeding her family nutritional meals given her busy schedule as an instructor, spokesperson and chef. Despite public perception, she does all of the cooking, takes care of their children and their home. The goal of the N.C.O.F.® program is to demystify the advertising and provide caregivers with the names of companies and specific products that meet the standard of being healthy and nutritional for children. Chef Nikki is going to provide great recipes and fun ways for parents and grandparents to get children to eat what’s healthy and nutritious. Committed to spreading healthy nutritional awareness of and combating childhood obesity, Chef Nikki Shaw serves on the celebrity advisory board of the National Childhood Obesity Foundation®, Inc. and has spent countless hours offering information and recipes to help families make better, more balanced food choices. 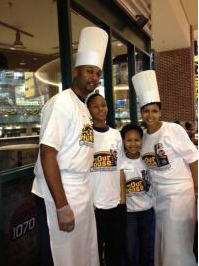 She’s been the featured chef for the Indiana Pacers and L.A. Lakers official websites, offering information and recipes to help prevent childhood obesity. Nikki is also a featured chef for the American Diabetes Association, American Heart Association and several healthcare organizations. She is also a spokesperson for the California Department of Public Health’s Network for a Healthy California & Champions for Change campaign. She's just barely moved into her new house, but Nikki Shaw has made sure that her fridge is stocked with healthy snacks and the kitchen has plenty of space for meals with her family — husband Brian Shaw, the new head coach of the Denver Nuggets, and their children, Bianca, 12, and B.J., 14. She attended culinary school near Orlando when Brian played for the Magic in 1994. By 2007, he was an assistant coach with the Los Angeles Lakers, and Nikki was a finalist on "Next Food Network Star." She went on to guest appearances on the MTV reality show, "From G's to Gents" and VH1's "Basketball Wives." Nikki, 45, says she started cooking at age 4, "as soon as I could reach the counter, and soon, I was using the oven, the stove, knives." Mentored by her Aunt Brenda, ("when she baked, she gave me my own dough to work with"), little Nikki, like many of us, became enchanted with a certain kind of biscuit. "What blew my mind was the Pillsbury Poppin' Fresh dough. I followed the instructions and put the oven on the number just like it said. Those biscuits were the first thing I cooked." "Brian was my biggest challenge. Years ago, I said 'Let's substitute ground turkey for beef and pork.' He said 'No way, that doesn't even sound right.' Little did he know I had been using ground turkey for years. I said, 'Hey, I'm adding years on your life, guy.'" "She's had a major effect on how I eat, now that I'm retired from playing," said the 47-year-old coach after a long day at the Pepsi Center. "I could pretty much eat anything that I wanted and burn it right off. Now, I don't get to exercise as much as I would like to." He laughs about the turkey story. "We didn't go cold turkey — no pun intended. We acquired a taste for it, although we didn't know it at the time. She can spice it up and make it tasty where you don't miss the pork at all." "We are in the midst of a crisis and we have to make healthier choices. Diabetes and heart disease — that hits home. If you eat right and drink right, you can prevent these conditions. I truly believe that instead of the drive-through, let your fast food be the rotisserie chicken in the deli, and grab a salad. You can get in and out as fast and it adds years to your life." "The kids will come in and grab some fruit and yogurt, some granola and nuts and eat them together. They need their bodies to perform every day," says Nikki, who has taught them both to cook. "You know the term 'feng shui?' I don't know if that really applies to cooking, but that's what she does — the way she presents the food," says Brian, as dinner is served. "Tonight I'm eating crab legs with lemon-butter sauce with broccoli and brown rice. The colors pop." 2. Eat what's in season. Right now, look for squash, apples and pears. Produce is more abundant and more affordable when it's in season. 9. Invest in yourself. When people say they can't afford to eat better, Nikki Shaw says, "here's the thing: you're going to pay now or you're going to pay later. Invest in yourself now." Chefs and parents are joining forces in the fight against obesity. Good health depends on the support of both professional kitchens, where we create healthy menu options, and in homes, where we put healthy food on the table for our families. For the past couple of years, I have partnered with the Network for a Healthy California to help improve the health of families, especially those that are at greater risk of obesity and suffer from serious health problems. With the help of the Network, I want to empower parents to make healthy changes for their families with the same tips and recipes that have helped me be a successful chef and mom. To fight obesity, we have to make healthy changes in our kitchens, in our neighborhoods as well as in grocery stores, schools, places of worship and in workplaces. You can start today by joining the movement and liking the Network for a Healthy California on Facebook. • Cook as a family. Involve your kids in picking recipes and choosing healthy fruits and vegetables for every meal. Show them how to prepare healthy dishes and snacks so they can feel they’re helping. • Keep moving. Set an example and make time every day to enjoy activities like walking, biking or dancing. • Make it fun! Prepare snacks or meals that kids will want by choosing colorful combinations, putting fruits or vegetables onto a stick or cutting them into fun shapes. 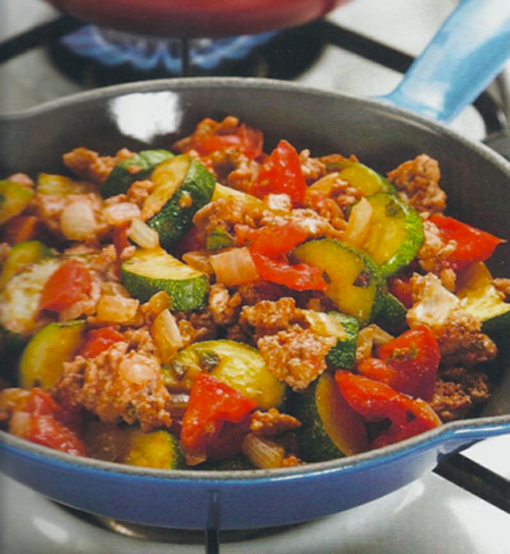 One of my favorite dishes for fall is the Easy Turkey Skillet Dinner. Spray nonstick cooking spray in a large skillet. Add tomatoes, tomato paste and seasonings. Simmer over medium heat for 10 minutes. Add zucchini and cook for 5 minutes more. Serve while hot. Let's Talk is a place where I share some of my favorite recipes, healthy eating and lifestyle tips!